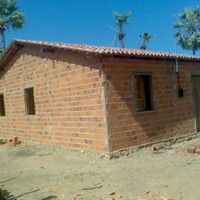 In Brazil, SERVE works in two communities with Caritas Parnaiba in the north east of the country. The area of Ilha Grande (8000 people in 9 Communities) and Parque Estevao (200 families/ 817 people) are residents on the periphery of Parnaiba, the second biggest city in the second poorest state in Brazil- (Piaui) and are multiply deprived communities. They display all the characteristics of favelas as officially defined by IBGE. Families live in sub-standard housing. There is a lack of clean water resources, sanitation, health posts, police stations, schools, street pavement, public lighting and washing areas. The social capital is weak and is evidenced by weak community leadership, poor self-esteem, violence, high levels of illiteracy, poor child attendance and performance at school, high levels of sickness amongst children, poor knowledge about rights, weak income streams and disengagement from social services and the political system. The year 2013/14 is the third year of a three year initiative whereby the project targets two of the poorest areas in Parnaiba, namely the Ilha Grande and Parque Estevao.